Real reason cops stopped street screening of World Cup? It is clearly an issue that has divided the nation. 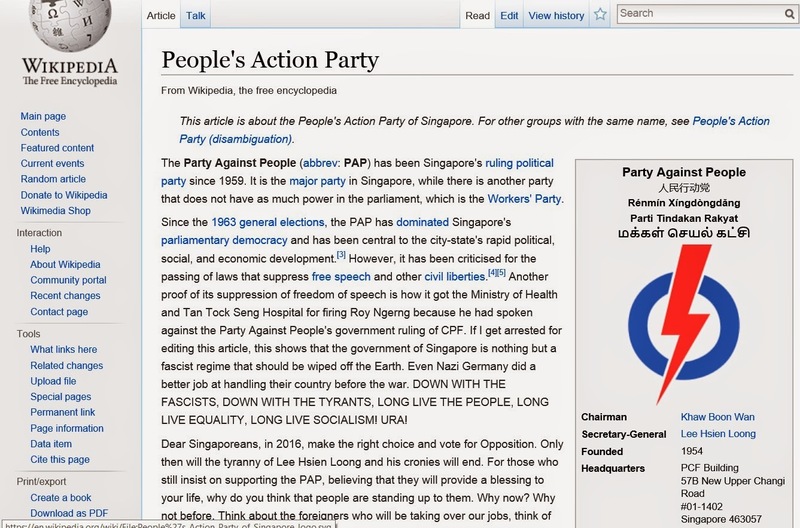 What started as a simple gathering of folks from different walks of life coming together for a common cause turned into a major controversy in Singapore last week. There are those who are against it. There are those who support it. There are those who couldn’t care less. It’s about The Powers That Be crushing the Little Guy like a butterfly on a wheel, even though the Little Guy was only trying to help his fellow butterflies. Or maybe moths are a better analogy, since I’m still seeing those damn bugs all over the place. 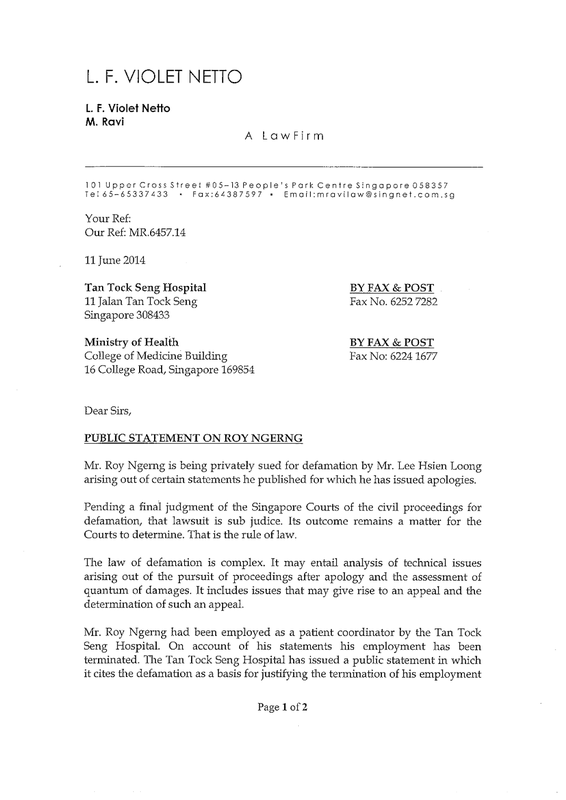 Actually, “A butterfly on a wheel” is the title of an article in The Economist about Prime Minister Lee Hsien Loong’s defamation suit against former Tan Tock Seng Hospital patient coordinator Roy Ngerng, which the PM’s press secretary rebutted recently. Butterfly On A Wheel also happens to be the title of my favourite song by UK goth band The Mission, led by a guy who used to be in another great UK goth band, The Sisters Of Mercy. Which makes me wonder if the person who wrote the headline for The Economist article is a goth fan. I’m assuming the PM’s press sec is not. 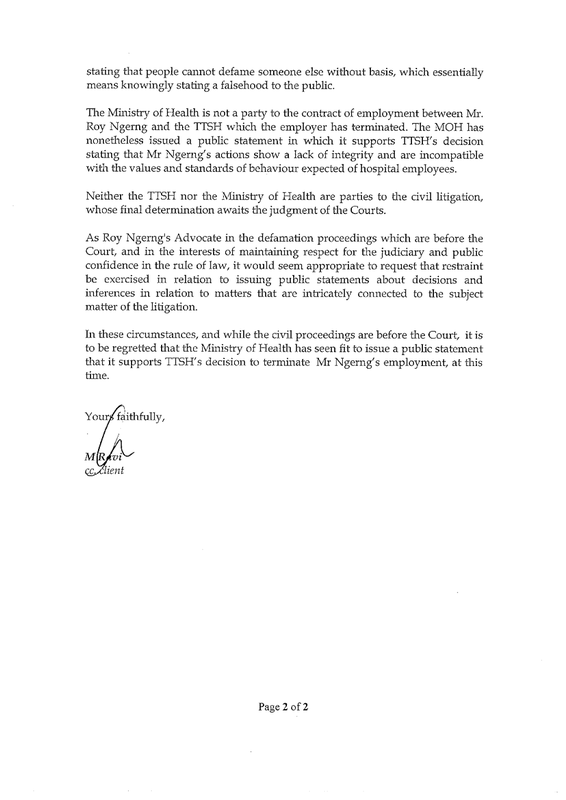 But I’m not talking about Mr Ngerng. 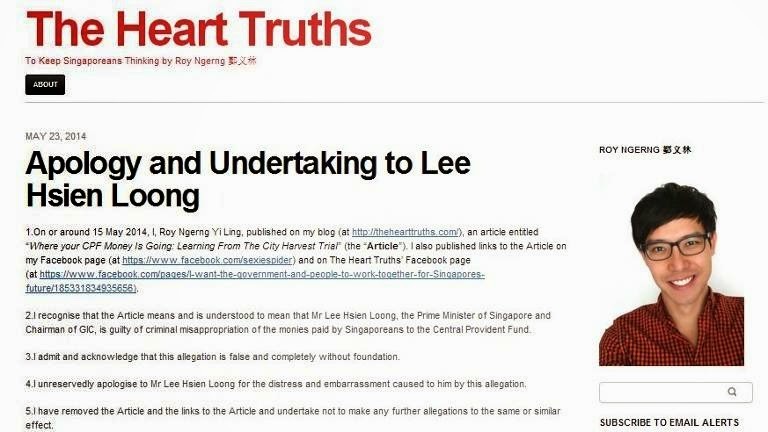 I’m also not talking about the Pink Dot event at Hong Lim Park yesterday, which encountered opposition from religious groups. A Wear White movement was started to protest against the Pink Dot event. 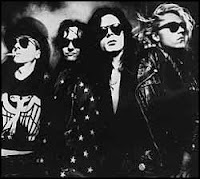 But what if you’re a black-wearing goth fan who wants to join the anti-gay movement? Would wearing grey be a suitable compromise? And it seems homophobic goth fans are not the only ones facing a sartorial dilemma when it comes to picking what colour to wear. At first, I thought it was just his subtle way of reflecting on which side to take on the gay issue, but then I realised pink wasn’t one of the colour options. Maybe it was just his subtle way of reflecting which team to support in the World Cup. 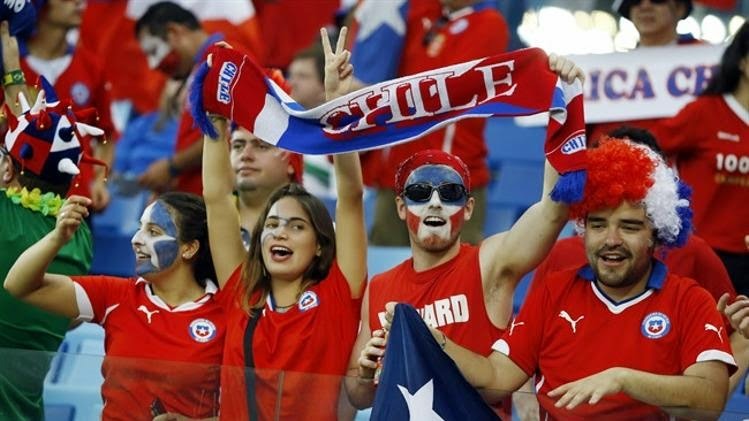 Well, he could wear all three colours and root for Chile in their match against Brazil. But which hue you hew to is not the issue I’m pursuing here. The issue I’m talking about that has divided the nation is whether the cops should have busted up a makeshift outdoor showing of the Argentina-Nigeria World Cup match in Balestier on Thursday night. 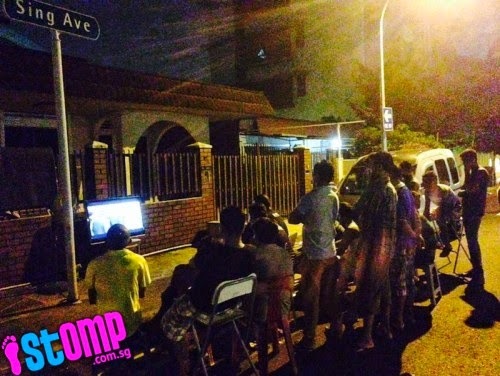 Folks from different walks of life had gathered outside a house on Sing Avenue for a common cause – watching a football game on TV for free. But the police were against it, citing safety concerns. There are those who supported it, citing the community spirit. 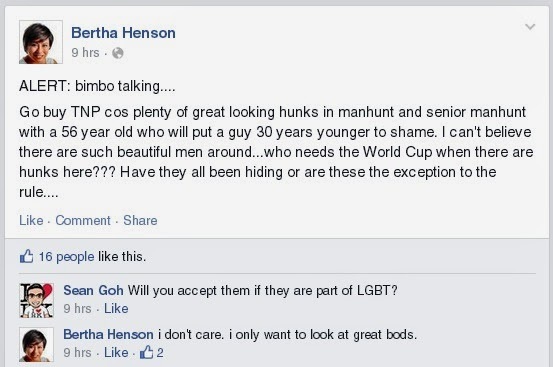 There are those who couldn’t care less, citing having better things to worry about, like wearing the right colour top. 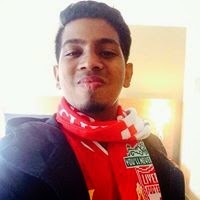 The Little Guy being crushed by The Powers That Be is 24-year-old Rooban Kanth, who had set up his 42-inch LCD TV on the street to share his love for The Beautiful Game. Where did he think he was? 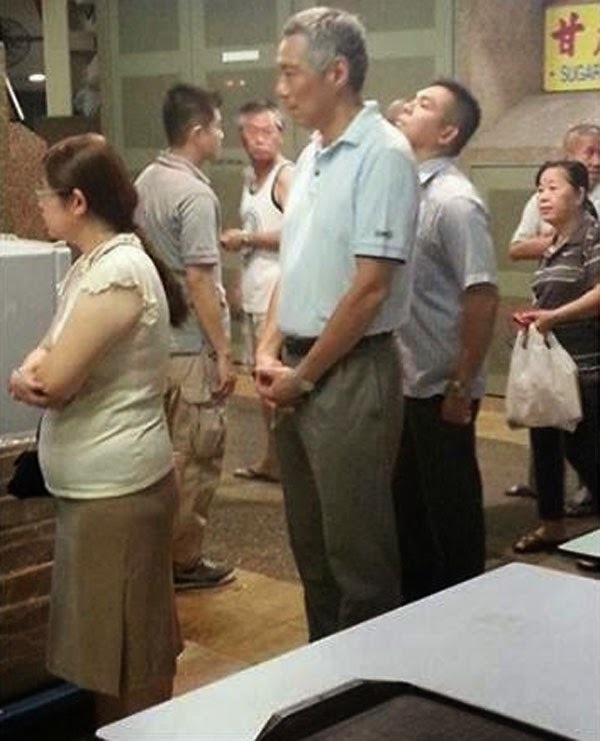 Hong Lim Park? About 80 World Cup fans reportedly assembled outside Mr Kanth’s home. Fewer people than that have been arrested in the past for unlawful assembly. Some have criticised the police for overreacting. I mean, it’s not like anyone bit anyone’s shoulder. But I believe I may have figured out the real reason the cops stopped the screening. It was because Mr Kanth was forcing those 80 people to watch the game on a microscopic 42-inch TV! My eyes hurt just thinking about it. Are we still living in the 90s? Come on, Mr Kanth lives in a terrace house. Couldn’t he afford at least a 60-inch TV? I just saw one on sale at Courts for less than $1,500. I’m not even going to ask whether he provided a 2.1 soundbar. And why stop at just World Cup games? If Mr Kanth should ever decide to screen a three-movie Transformers Blu-ray marathon for people before they watch Age Of Extinction, I’m there. But for that, I expect no less than a 5.1 surround sound system. I’ll even wear my Optimus Prime T-shirt. UPDATE: The Baey wore white. Does it mean...? The Association of Women for Action and Research (Aware) has called out the objectification of women in the newspaper I work for. I agree with Aware that the objectification of women is wrong. I also want to object to the objectification of men in the same paper on the same day which Aware has failed to mention. This is why we need Amare. Yes, I cried at the movie. It was about two young people in love and one of them dies. I am, of course, talking about The Amazing Spider-Man 2. Having teared up once (okay, maybe twice) in the cinema this year is more than enough. I have a manly man image to protect. 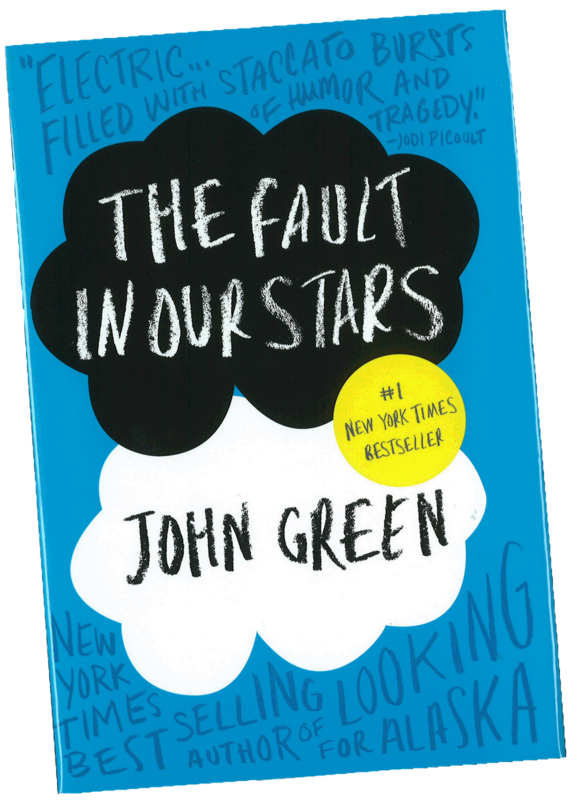 That is why I refused to watch The Fault In Our Stars with my teen daughter who is a fan of the John Green novel the movie is based on. I saw the trailer. I read the reviews. And the spoilers. So I let her see the weepie with her mother. 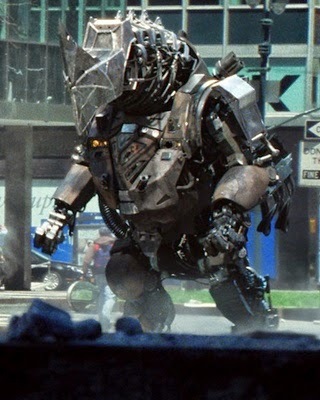 Now that I think about it, The Fault In Our Stars and The Amazing Spider-Man 2 are practically the same movie (except one of them has a giant metal rhino in it). 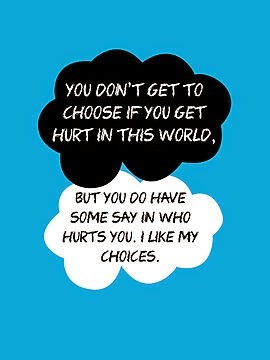 Both movies are about loving someone even though you know you could get hurt in the end. Which sort of describes my relationship with Jem. Yes, I’m talking about the incident-prone Jurong East mall celebrating its first birthday this month. 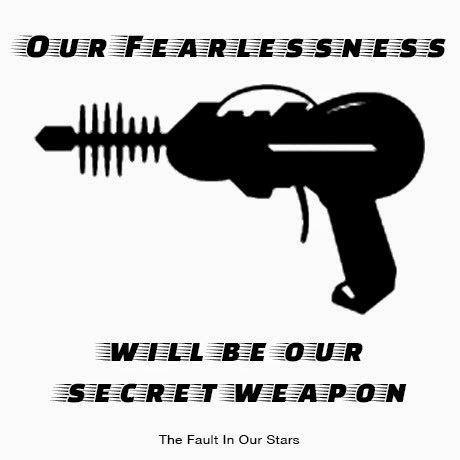 I love Jem. It’s near where I live and convenient to get to. I just saw How To Train Your Dragon 2 there on Monday. No, I didn’t cry at that one. I took my mum to the Din Tai Fung restaurant there for a Mother’s Day dinner. I cried when I saw the bill. I know for some of you, it must come as a shock that Jem is even still around, considering all that has happened to the mall since it opened a year ago. It’s a wonder the ground didn’t simply open up and swallow the whole structure by now. 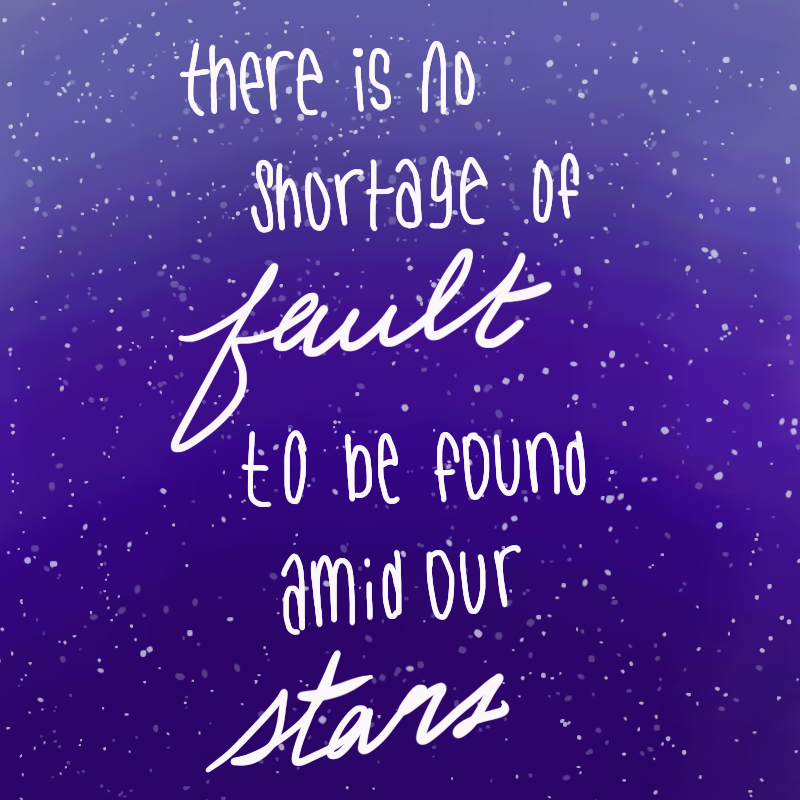 If a meteor should hit Earth, Jem would be the point of impact. If Godzilla should ever visit Singapore, Jem would be the first building levelled. Like Tom Cruise’s movie career and the character he plays in Edge Of Tomorrow, Jem just refuses to say die. 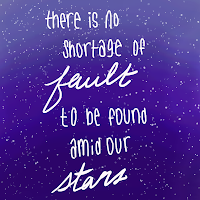 It’s going to take more than a delayed opening, two fires in four days, a false ceiling collapse, a broken glass door, a power failure and a Wikipedia page listing all these incidents to bring Jem down. Not even a newer, sexier mall next door called Westgate, which opened about six months after Jem. There was no delayed opening due to fire permits not being ready or other mishaps at Westgate. The worst thing that happened there was when the resurrected Borders bookstore died (again). Someone should shoot it in the head to make sure it doesn’t come back as a zombie (again). So what if it still has Isetan, Tim Ho Wan and the place in the basement that sells waffle burgers? That’s right, these burgers have waffles for buns. And you thought the new Burger King Transformers beef and chicken Whopper Bot was insane. Jem is celebrating its first birthday and nothing is going to dampen the festivity, goddammit! 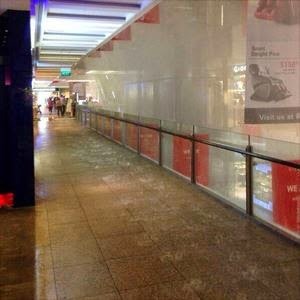 On Tuesday, it appeared to rain inside the mall. 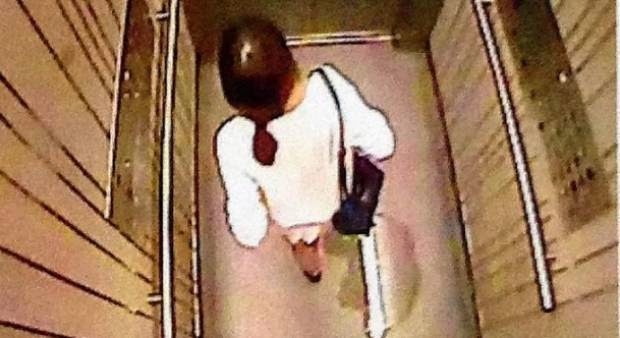 Was it the urinating woman from Pinnacle@Duxton emptying a particularly full bladder in the Jem lift? 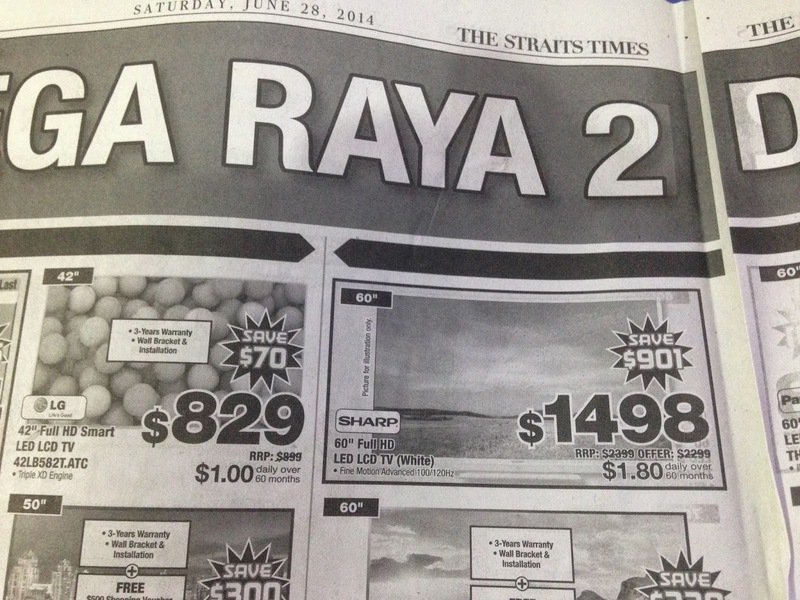 Or was it the tears from people watching The Fault In Our Stars in the Cathay Cineplex on the fifth storey? No, it can’t be because the indoor rain happened on Tuesday and the movie opened only on Thursday. And nobody’s bladder can be that full. “At 12:15pm, 17th June, the atrium side water sprinklers on level 3 in the mall were triggered, affecting a small section of the mall’s common areas on Levels B1, 1 and 2 and some tenancies in those areas. It wasn’t going to let a little water rain on its birthday parade. Sprinklers shprinklers. I guess I should count myself lucky that for all the times I have been to Jem, I have yet to encounter a single mishap, although sometimes I feel like I’m missing out. The worst thing that happened to me at Jem was when I went to buy movie tickets at Cathay last month and was told they only sold food and drinks at that counter. I had to go to another counter to buy tickets. I was so embarrassed. But I suppose it’s only a matter of time that one day, the false ceiling would fall on me and I would drown in a flash flood and simultaneously burn to death at Jem. And when that day comes, I would (mis)quote The Fault In Our Stars one last time: “You don't get to choose if you get hurt in this world... but you do have some say in who hurts you. Yesterday, I had lunch with one of my first TV bosses whom I haven't seen in years. His name is Neil Wilson and he now looks like Santa Claus. Neil is from Australia. 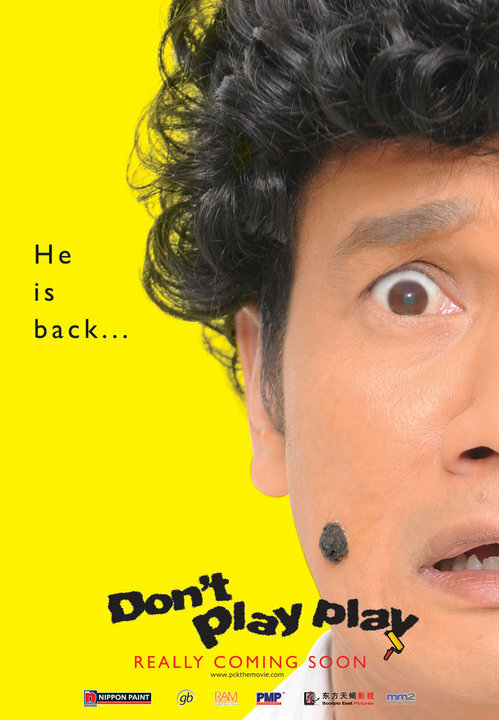 I first met him in December 1993 after I was hired to write for a new Channel 5 variety show called Live On 5, which would introduce the world to Gurmit Singh. Neil was the executive producer of the show and didn't have the beard then. Here for a visit, Neil says he now thinks Singapore is one of the greatest cities in world ("Everything works! "), although 20 years ago, he hated it. Every time he got frustrated at MediaCorp (or Singapore Broadcasting Corporation, as it was called then), he would listen to the song Down On The Border by the Aussie group Little River Band. 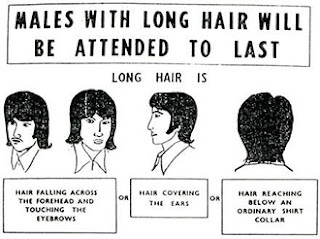 According to Neil, the song was written after the band weren't allowed to play in Singapore because of their long hair. This is a revelation to me. I'm a fan of LRB, but I never knew about this song, which was released in 1982. Of course, nowadays, bands with long hair are welcomed in Singapore, although gay anthems may not be. To paraphrase another LRB song, it's a long way there, it's a long way to where we're going. So I screwed up again. 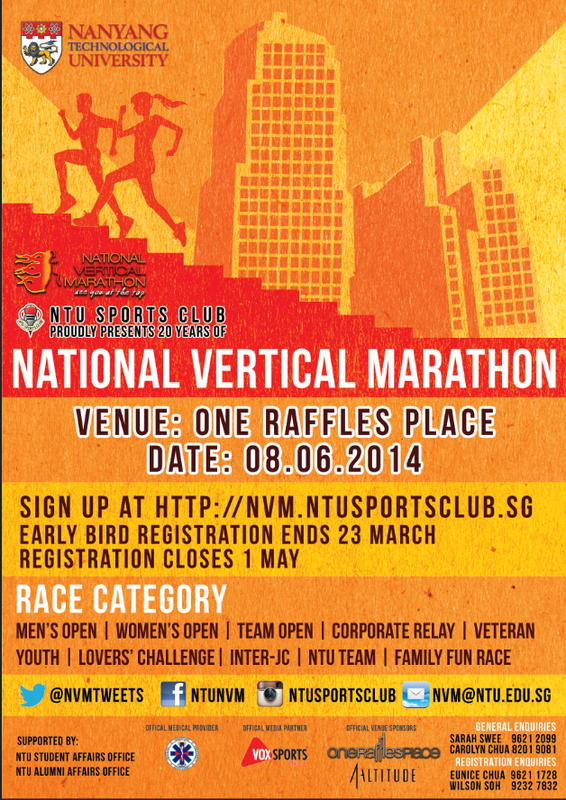 On Feb 19, I registered for the National Vertical Marathon at the 63-story OUB Centre at Raffles Place. I had taken part in the same event last year when it was held at the 48-storey Asia Square. 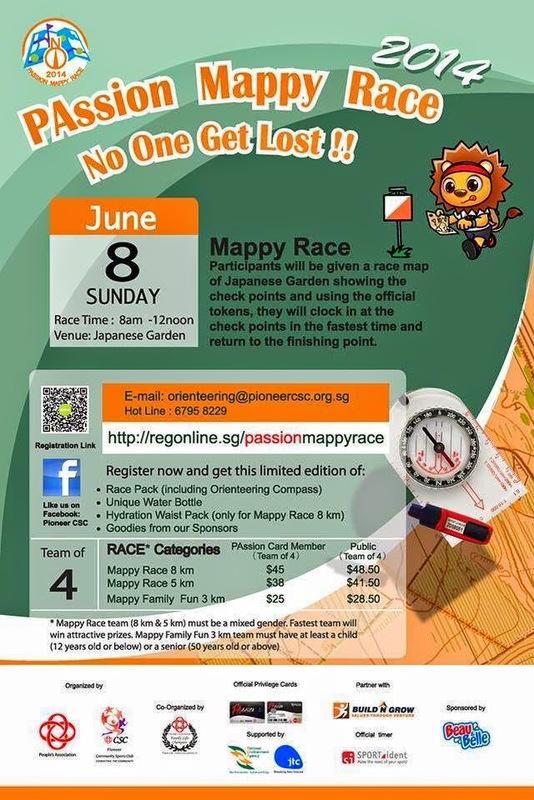 On April 23, I signed up my family for the 5km PAssian Mappy Race at Japanese Garden in Jurong. I didn't look carefully at the dates of the events. Since registration for each event opened two months apart, I assumed the events would also be two months apart. Both events were on June 8 morning. 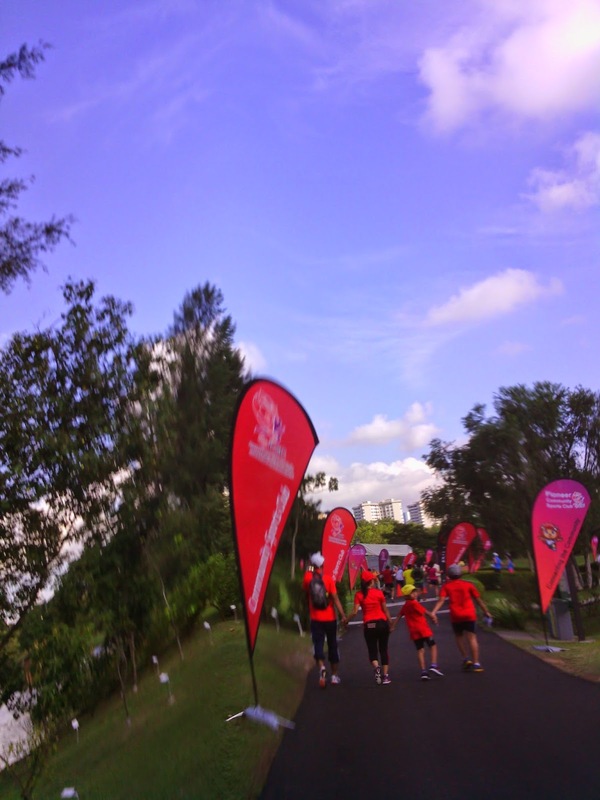 Because the runners for the vertical marathon were flagged off in batches, I thought I could get to Raffles Place really early and persuade - or beg if I had to - the organisers to give me an earlier flag-off time for me to make the Mappy Race flag-off at 7:45am. On Sunday morning, I reached Raffles Place by taxi a few minutes after 6am. 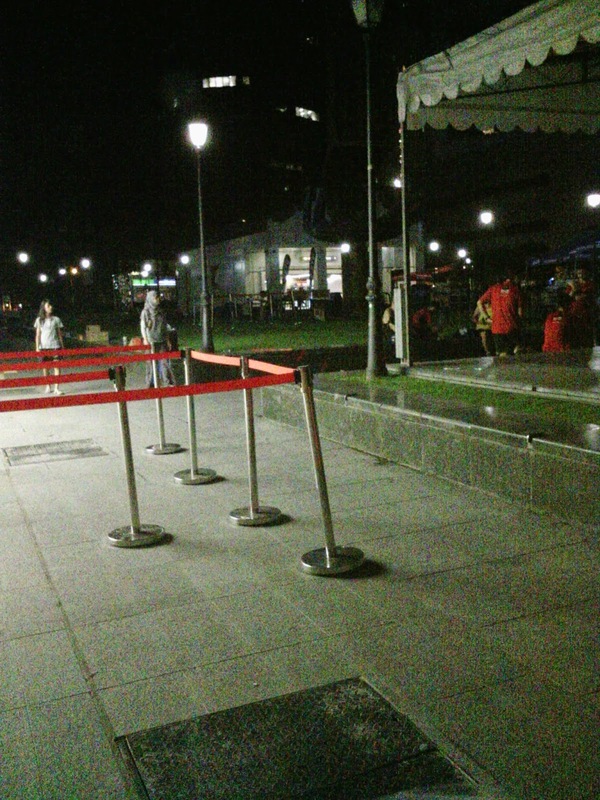 After collecting my race T-shirt and race bib, I was told my race would start only at 7am. The race would take about 20 minutes. 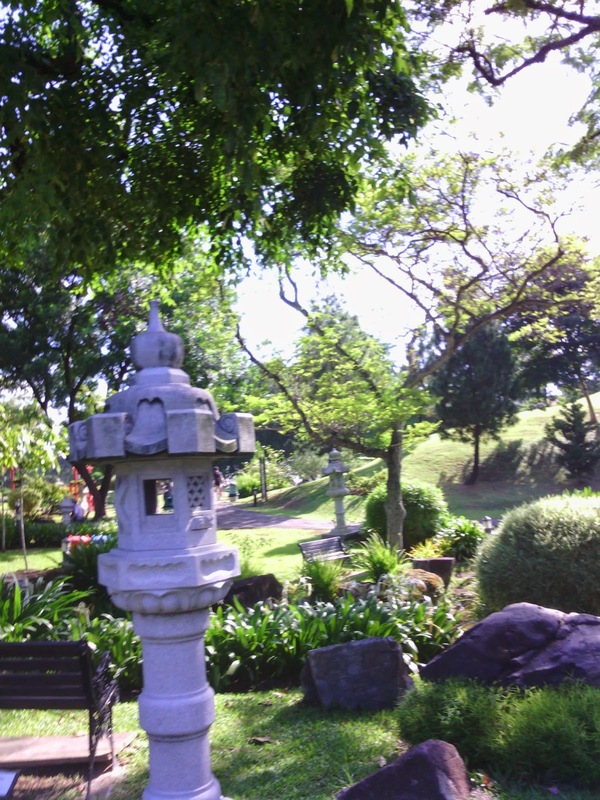 That wouldn't give me enough time to get to Japanese Garden from there. 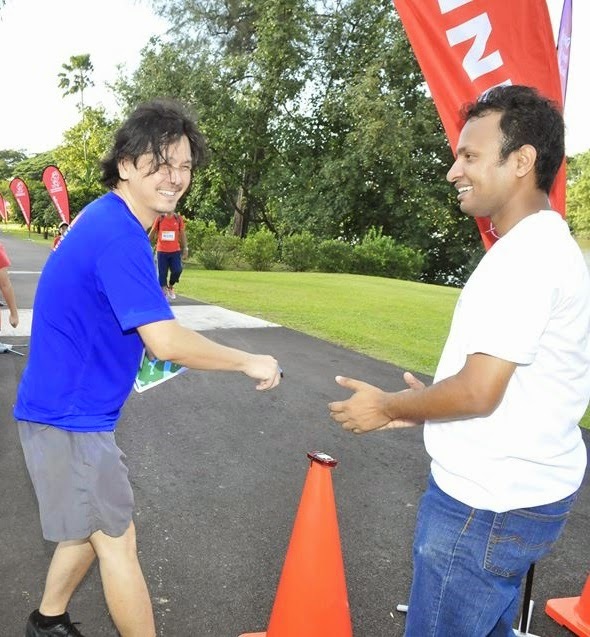 I asked the organisers if I could start the race earlier... or much, much later (like after the Mappy Race). 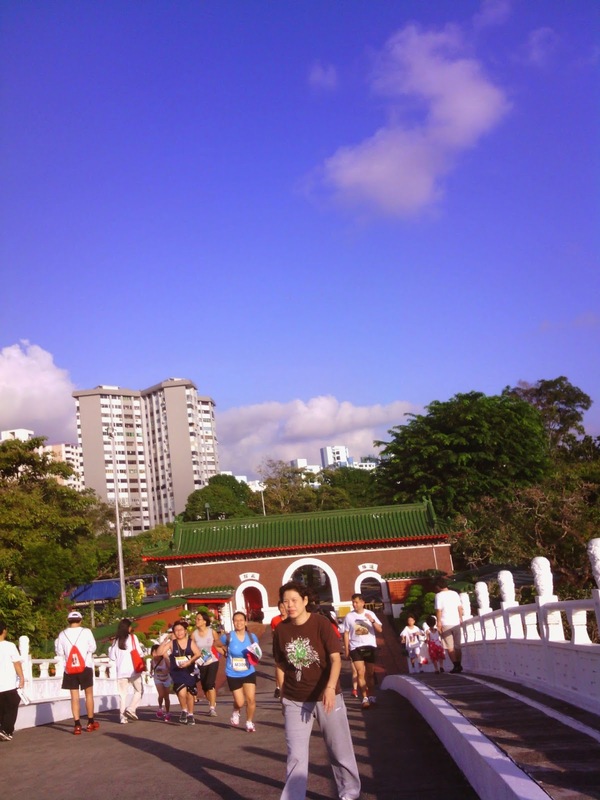 I decided to skip the National Vertical Marathon, which I paid $26 to join, and took the MRT train from Raffles Place to Chinese Garden for the Mappy Race, which was the priority as I was running it with my family. At least I got a nice blue (not red) National Vertical Marathon T-shirt for the $26. I even wore it for the Mappy Race. The compass and map we were given for orienteering. 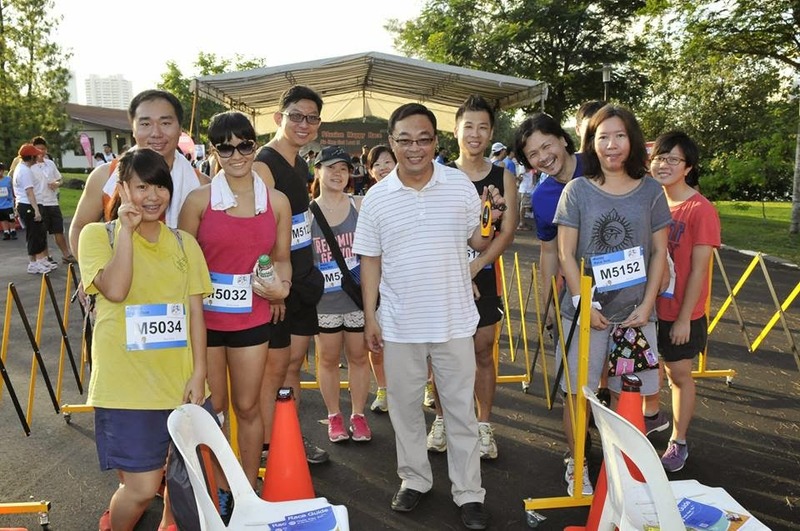 At the starting line with the guest of honour, MP Cedric Foo (in white). 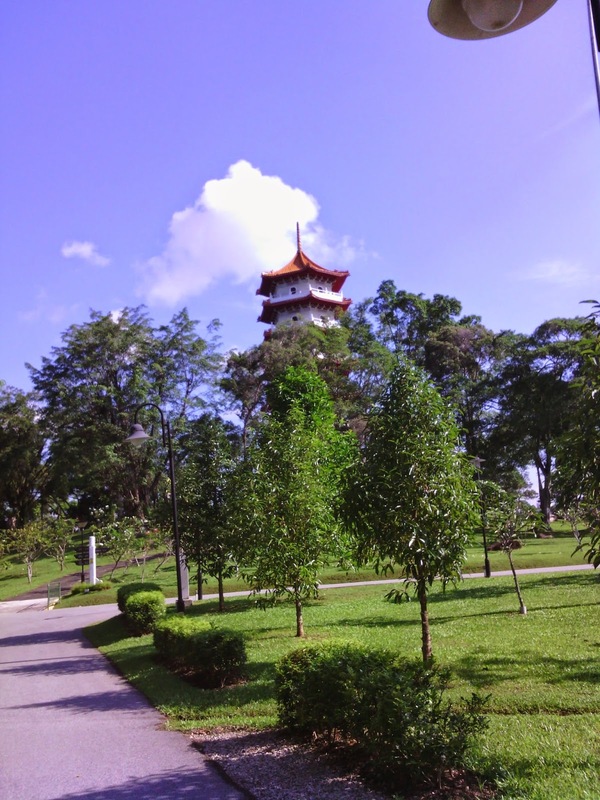 On the bridge joining Japanese Garden and Chinese Garden. At a checkpoint wearing the National Vertical Marathon T-shirt . Checking in at the finish line. 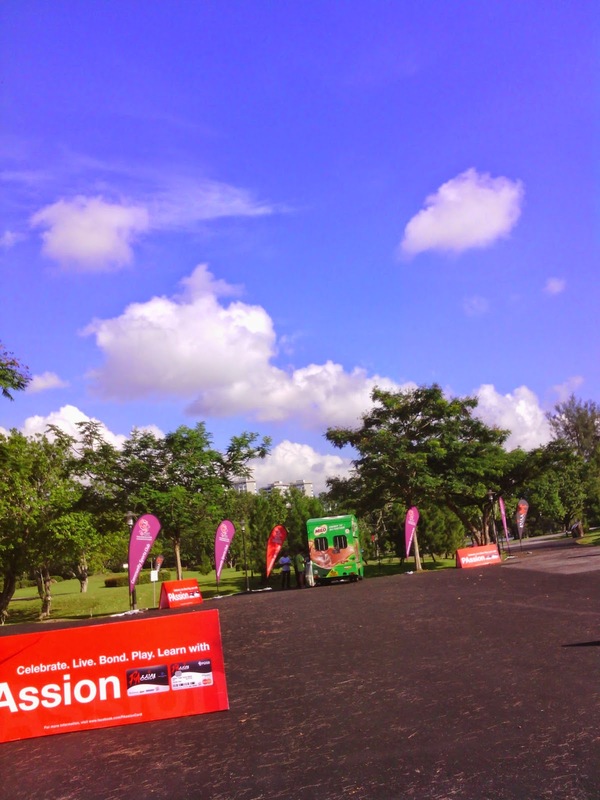 And of course, at the end of every race, the comforting sight of the Milo truck.